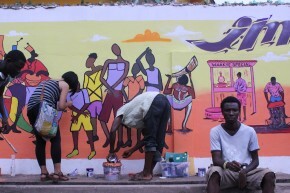 For more than 30 years now, the trading in Accra’s Kantamanto Market has contributed and linked in to the urban center’s economic productivity and vibrancy. Located near the Makola Market area, Kantamanto is its own market, separate and distinct from Makola. It’s home to more than 30,00 traders, who sell most commonly secondhand clothing, but also spare parts, household decorations. Two vendors, Boadi and Yaw Intim, sell used and new football shoes at Kantamanto Market in Accra. The most immediate sounds of Kantamanto are the sellers working to attract their customers. “One, one cedi, belts, one, one cedi,” calls out a woman in a high-pitched voice, her feet and calves submerged in a colorful, knee-high pile of skinny belts. 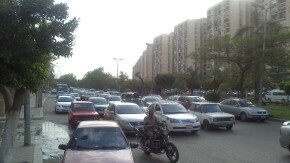 A seller hoists a wide bucket of water satchets over her head, weaving through the traffic of early morning customers. “Pure water!” she calls. There’s the booming volume of local highlife music piercing the air as music vendors sell their pirated CDs and DVDs; there’s the haggle between customer and vendor as they negotiate selling prices. Occasionally, there are also the fervent pastors, who stake out their makeshift church spaces, blasting their religious dogmas via megaphone in local Twi or Ga to anyone who can hear. The market appears like a maze at first; rows and rows of sellers staking out their spaces and selling their wares. There’s the indoor, covered market, the outside market spreading onto nearby walkways, and the vendors with stores in cemented structures. Just like a traditional department store in the West, Kantamanto too has its own sense of order, with specific sections of the market. Here, vendors specialize (selling a specific type of item), but they also agglomerate in clusters to draw the greatest traffic of potential customers. There’s the expansive women’s clothing section, welcoming you at the entrance near Merchant Bank, where vendors’ stalls teem with piles of clothes, some heaped up together, the most colorful or attractive flaunted on hangers overhead: Some vendors here sell ladies’ shirts; others ladies’ skirts; others, ladies’ dresses or suits. Women’s belts, and nail polish. Beyond, deeper into the market, there’s the men’s section, where you can buy T-shirts, jeans, suits, and more. There’s the shoe section, there’s furniture dressings (bedsheets, curtains, towels), the electronics section (where CDs and DVDs are sold). There’s the shoe section, where one can find anything from Adidas and Birkenstocks (some real, some fake), to Tom’s and Nike trainers, new and used sandals. Inside, most of the stalls are numbered; outside, sellers have overtaken pathways and sidewalks, littering both with goods for sale. Used and new men’s football shoes for sale at Kantamanto Market, in Accra, Ghana. 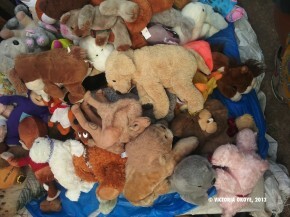 Used children’s toys for sale at Kantamanto Market, in Accra, Ghana. Day in and day out, with Sunday as the only off day, the vendors are here early – many at dawn or even before the sun itself is quite up, with customers not far behind. This market, filled with “informal” traders, holds significant economic importance – for the traders who make a living here, as well as for the reverberating incomes it provides thanks to its local economic linkages. Despite the occasional threats of eviction and in some cases, actual force, the Accra Metropolitan Assembly (AMA) has allowed these sellers to work here and for the area to thrive – tacitly approving their and the market’s existence when it hasn’t interfered with its city development plans. The secondhand clothes originate from places like Europe and Asia, especially Korea and China, as castaway, donated clothing. In his writings and photography of Kantamanto, Nana Kofi Acquah says that locally, when the importation of used clothes, cars and other items began in the 60s and 70s, it was called “broni we wu” (“the white person has died”), built around the conception that no one in their right mind would willingly give away such nice articles, so the people must have died, and that’s how they arrived in Ghana. These days at Kantamanto, distributors — who source the clothes abroad and resell them locally — sell the clothes in bulk packages to local vendors at the market, who in turn sell it to their customers. One distributor says he comes to Kantamanto Mondays and Thursdays to sell the bulk packages of clothing; each is about three feet by two feet in size, wrapped and tied with plastic string. Nasiruwa, who has been working at Kantamanto Market in Accra for more than 15 years, provides storage space to the clothing vendors. The vendors can rent space for 2 Ghana cedis per month, he says. 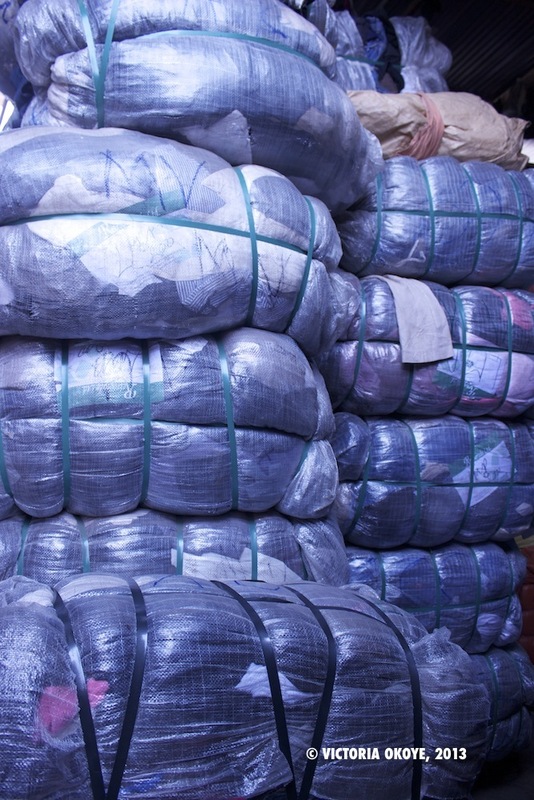 Packages of imported used clothes to go on sale at Kantamanto Market, in Accra, Ghana. 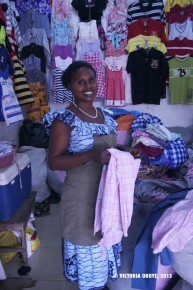 The earliest customers have their pick of the clothes, and they can also negotiate the best prices with the vendors. From no-name brands to well-known ones like H&M and French Connection ladies’ shirts, to Chanel purses and Tom’s shoes, it seems Kantamanto is one huge thrift store, where the gold is there for those who come early and search for it. 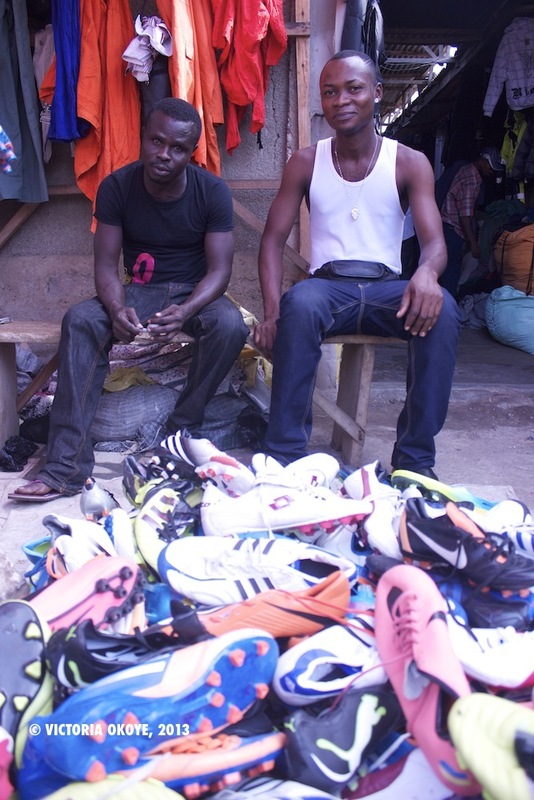 Boadi and Yaw Intim work together, on a spot outside the market, a pedestrianized walkway where they sell men’s football shoes, both used and new. 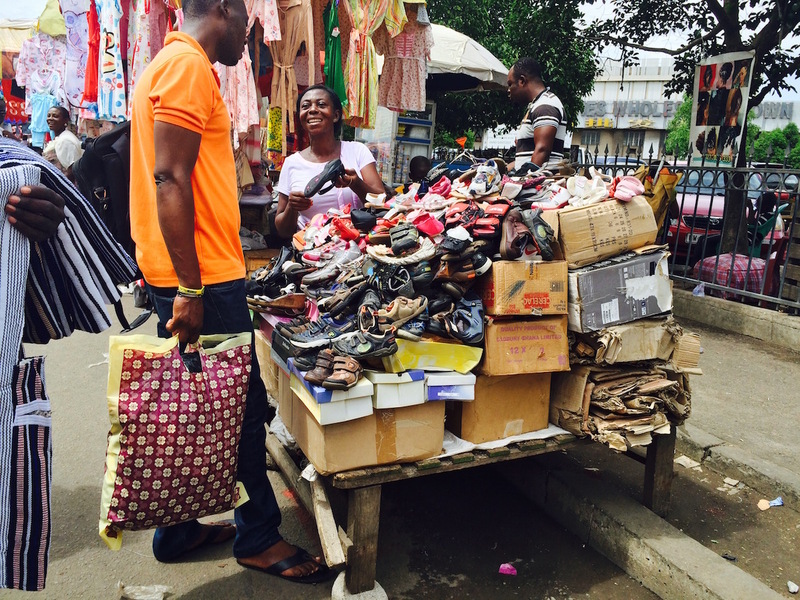 The area here is known to vendors as “June July.” The nicer, but used, shoes come from Europe and the US, Boadi says. He also has the lower-end shoes, which he says come from China by way of Togo. Distributors collect the shoes in locations there, and distribute it to places like Kantamanto, he says, and shipments come on Wednesdays and Saturdays. Boadi used to have a stall for many years inside of Kantamanto, but said he attracts more traffic outside, where he’s been for three years now. “You now, it’s not easy to get a place – that’s a shop – inside,” he says. “It’s easier outside.” He also says he gets more customer traffic in his new location. But Kantamanto isn’t just a market itself, where customers come as end users. 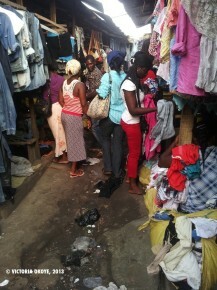 It’s also a stop along the distribution chain for clothing retail in the city – just as many stores around the city may source their items at Makola, it is well known that many “boutique” clothing shops who operate in the city also come to Kantamanto, where they select and purchase items for resale, marking up the prices in their own stores. 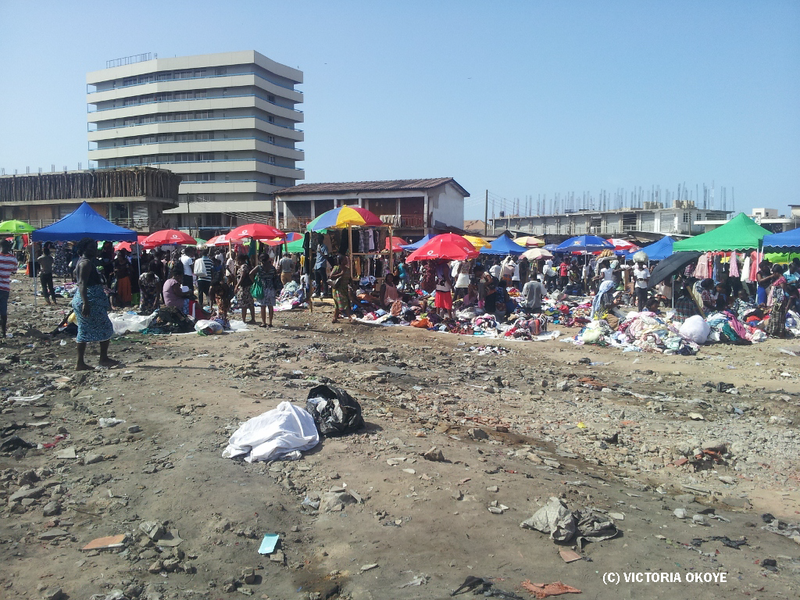 The Kantamanto Traders Association is the local organizing body for the more than 30,000 traders who sell at the market. 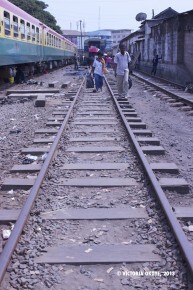 In recent years, it’s been the tool for appealing to government bodies to protest threats to ejection of the traders, especially given the Accra Metropolitan Assembly and the Ghana Railway Development Authority’s interventions in 2011 to refurbish the railway line that cuts near the market. “Most of us have [for] over 30 years depended on trading for our daily income at Kantamanto,” said Samuel Amoah, Kantamanto Traders Association Chairman during a press conference to appeal to government agencies. “We agree to the expansion and modernisation of the railway system, but the ejection exercise will put about 30,000 traders out of business,” he said. 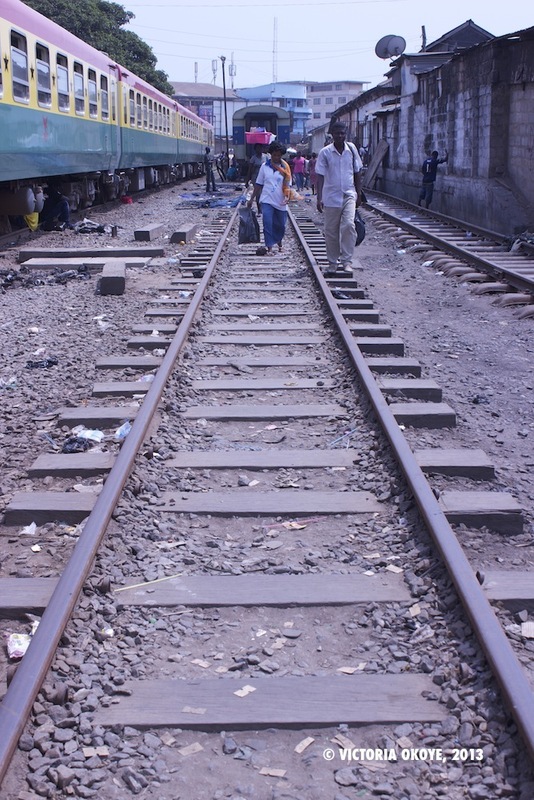 The railway line with a station at Kantamanto Market was refurbished in 2011 and 2012, and dozens of vendors who did commerce here were ejected to make way for development. The expansion was done, and dozens of vendors were ejected to make way for the railway that now runs from Kantamanto through Dzorwulu and onto Tema. Reuters journalist Claire MacDougall wrote in 2011 that the ejection took place despite the fact that the market traders and the association had signed a 50-year lease with the railway agency in 2008 and termination required six months’ notice. The vendors received 10 days’ notice instead. In Ghana, where land is most often owned by communities and administered by chiefs and traditional leaders, squatters are virtually unable to make claims on the land based on tenure, which gives the state the legal force to evict them. A young man who works at Kantamanto Market. 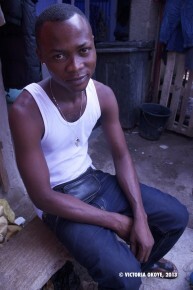 His works with his boss, Nasiruwa, who provides storage space for vendors. 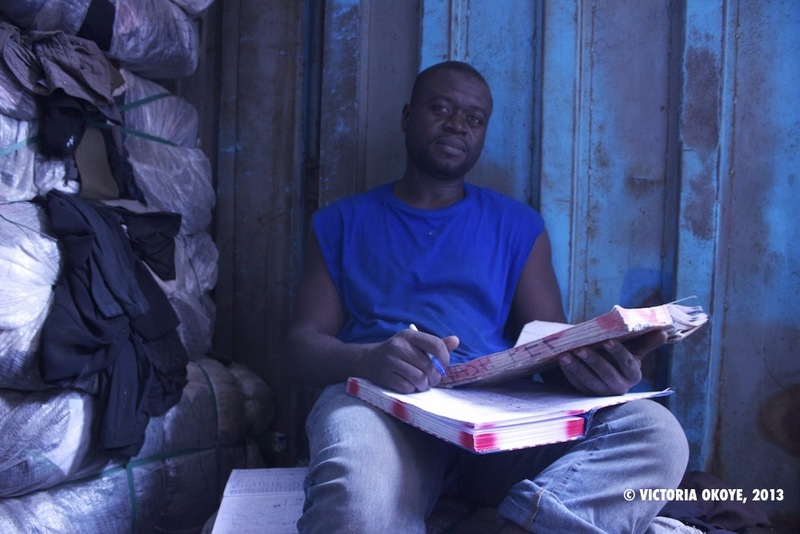 Yaw Intim, who works with his colleague Boadi in selling man’s shoes. 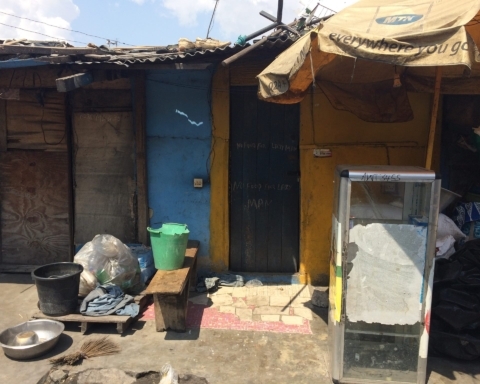 Vida, who has been working at Kantamanto for more than 10 years, has this space and a nearby store space where she sells women and children’s clothes. 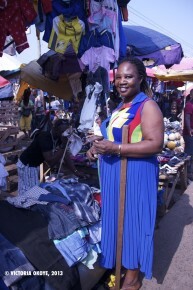 Sophia sells women’s and children’s clothes at Kantamanto Market, in Accra, Ghana. 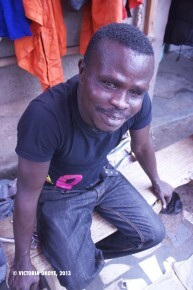 Boadi, who sells men’s football shoes at Kantamanto, has worked in both the inner section of the market, and now the outer section, where he says he has access to more customers. 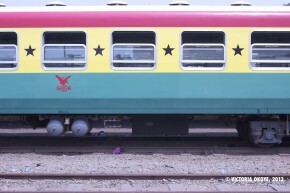 The train at Kantamanto Market in Accra, Ghana. Used children’s toys for sale at Kantamanto Market. Plastic-wrapped packages of imported clothes, to go on sale at Kantamanto Market. 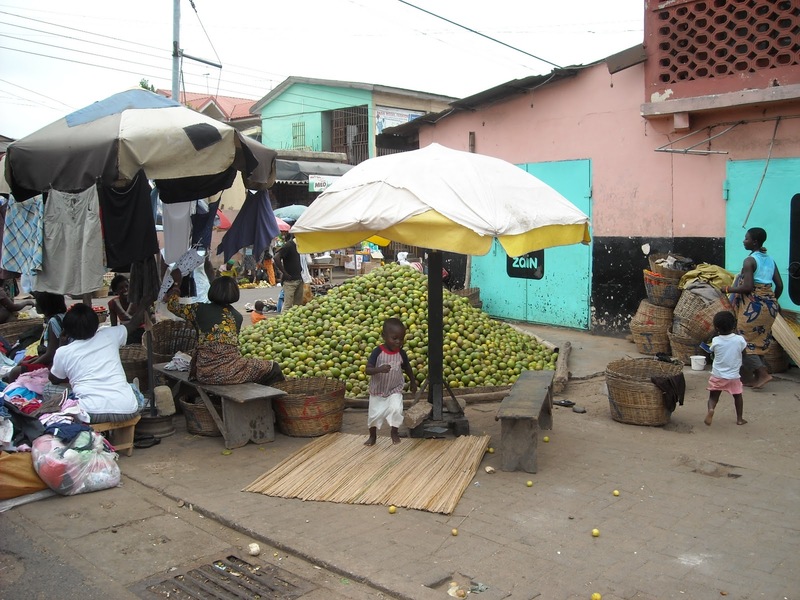 Vendors and sellers on a typical walkway in Kantamanto Market, in Accra, Ghana. 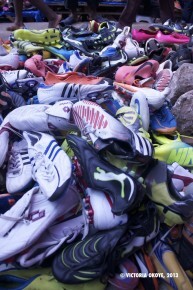 Men’s football shoes for sale at Kantamanto Market. 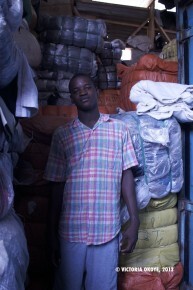 Nasiruwa, a vendor at Kantamanto who specializes in providing storage space to vendors. 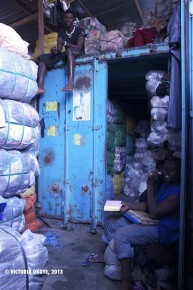 Nasiruwa’s space in Kantamanto, an immense container where he rents out space for vendors’ packages of clothes. 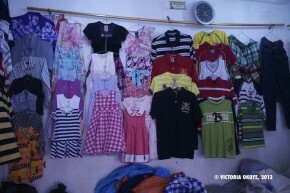 Children’s clothes for sale at Kantamanto Market.